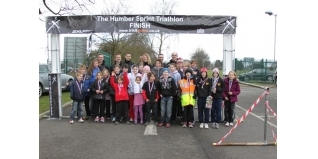 It seems like only last week we were settling in to Winter after a tough 2009, but already the 2010 Tri season has exploded to life in East Yorkshire with the SiS Humber Sprint Triathlon and Humber Tri Stars Junior Aquathlon putting hundreds of athletes from seven to 70 in to action on Easter Sunday. The advance weather forecast had been for snow, rain, fog, ice, hail, and any other weather type which could upset both competitors and race crew alike come race day. Fortunately the good weather booking form had managed to get through to the powers that be and we were treated to a glorious sunrise and clear blue skies followed. There was still a chill in the air (just to remind us we were still in early Spring) and the wind was biting at times, particularly out on the bike route. The Triathlon got under way at 08:00 and the nervous faces waiting pool side soon turned in to a stream of smiles passing through transition and heading out on to the bike route. The bike course has developed a reputation of being one of the more "challenging" in the area and at times the wind was quite ferocious for competitors in places making the challenge that little bit tougher, not that this deterred anybody and all who started on the bike finished strong and with determination, though maybe a little pinker than when they set off. The run route took in a two lap flat course, flat with the exception of a couple of passes over a foot bridge (a couple of times). By the time that most competitors were on the run route the sun was at full force making for an enjoyable and fast run. As the final few competitors of the triathlon cleared the pool the first of the Tri Stars got under way in the Humber Tri Stars Aquathlon, the Tri Start athletes cut through the pool in no time before passing through transition and putting the run behind them in some very fast times. The Tri Star 1, 2 and 3 athletes followed suit getting stronger and faster with every category and showing that age is no barrier in this sport, a lot of hard work and determination getting every Tri Star over the finish line and racking up the points in the Yorkshire and Humber Junior Series. Despite the blue skies and bright sunshine the wind was howling and the temperature didn't get out of single figures, showing just how tough these Tri Star kids are jumping out of the pool straight in to the cold and still performing at the highest levels without exception. The race crew were as always absolutely fantastic, providing support and encouragement to all competitors and the Hull Sports Injury Clinic did a great job of providing athletes with a post race rub down to help them ease the soreness.